In this section you will find many documents, which will be useful to go deeper into the topics we introduce through the map. Those documents are downloadable for free. So do it, read and share them! Here’s the secondo edition of “Mafie in Emilia illustrate per ragazzi” (Mafia in Emilia explained to kids). This is a project through which we tried to explain the phenomenon to children and teenagers using comics as a common language. This new edition contains many updates on Aemilia ongoing trial. Georgia Vecchione gave us the comics and we’re spreading it to schools, libraries and more. As Gesualdo Bufalino said once: “Mafia will be defeated by a troop of teachers”. These infographics summarize many themes developed on mafiesottocasa.com. They’re here for you, download them and make good use of them. You could even help us by checking the contents, we can’t make everything on our own! Realised by University of Bologna (Law and Political Sciences), AdEst, NoName, Articolo 21. The main topics are coerced stays, criminal infiltration in contracts, gambling. Realised by University of Bologna (Law and Political Sciences), AdEst, NoName, Articolo 21, Gruppo dello Zuccherificio. The main topics are stranger mafias, drug trafficking, prostitution, weapons, housing and building. Realised by AdEst, Gruppo dello Zuccherificio, GAP Rimini. 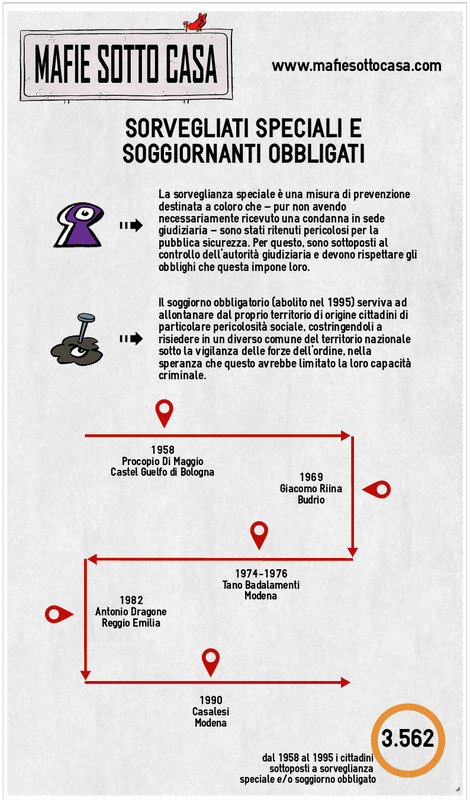 The main topics are the criminal infiltration in the rebuilding of the area devastated by the earthquake in Emilia-Romagna in 2012, drug trafficking and an historical background regarding the presence of mafia in Emilia-Romagna. Realised by AdEst, Gruppo dello Zuccherificio, GAP Rimini, R.E.T.E. San Marino. 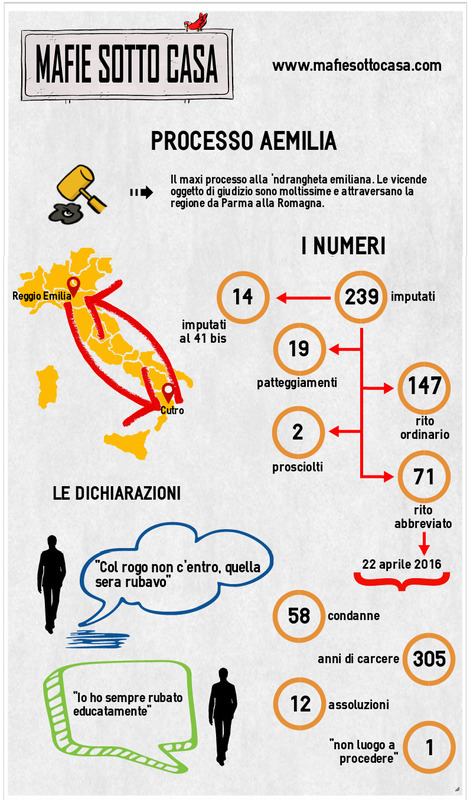 The main topics are the presence of mafia in Emilia-Romagna, with a special follow-up on the relationship between mafia and cooperation, drug trafficking and the role of Church. Chapters 1, 2 and 3 are updated to 31.12.2016. After six months of drafting, Francesca Zavaglia, the preliminary hearing judge of Bologna’s Court, filed 1400 pages where she listed the reasons that lead at the conclusion of the Aemilia trial on April 2016. The trial ended with 58 convictions in summary judgment, 17 plea bargains, 12 acquittals and a dismissal for requirement. Many defendants involved in the Black Monkey trial, chose summary judgment. Andrea Scarpa, the judge in charge of the preliminary investigations, recognised a simple criminal conspiracy plus the mafia related aggravating circumstance. Here below you can find all the reasons that lead to this conclusion, divided in two parts. On 22nd February 2017, Bologna’s Court read the ruling in which the mafia association, headed by Nicola Rocco Femia, has been recognised. While waiting for the reasons, we publish the dispositions. The Court disposed remarkable compensations for the plaintiff and confiscations. The Direzione Nazionale Antimafia (National Anti-Mafia Directorate) is a department of the General Attorney attached to the Court of Cassation. Its duties are to investigate on both italian and stranger mafia, drugs and human beings trafficking, money laundering, public contracts, financial preventive measures, eco-mafia (criminal activities in connexion with waste production, transport and disposal) and suspicious financial operations. Here you can find the last annual report. The Direzione Investigativa Antimafia (Anti-Mafia Investigation Department, also known as DIA) is the Italian multi-force agency dedicated to investigating and preventing mafia-related crimes. It is composed by State Police, Financial Police and Carabinieri corps. Here you can find all the six-monthly reports published from 1998 on. On 26 October 2016 the Legislative Assembly of Emilia-Romagna approved the draft law named “Testo unico per la promozione della legalità e la valorizzazione della cittadinanza e dell’economia responsabili” (Consolidated Law on the promotion of legality and valorisation of responsible citizenship and economy). The Law, made of 49 articles instead of the 170 of the old version, reorders the previous measures and introduces innovations in order to promote the culture of legality, the fight against usury and racket, controls on contracts, employment protection in companies under the effects of court judgements, safety at work, actions aimed at recuperating seized properties, prevention and fight against corruption. Avviso Pubblico is an association made of local and regional institutions against mafia. They publish an annual report containing all the threats to local administrators. Please, find the 2015 Report here below; here you can find the previous editions. We don’t all sit back and watch the gambling phenomenon ruining our lives. Many virtuous townships provided themselves many rulings restricting opening hours for slot halls or imposing a certain safety distance from different kinds of places. Argelato, near Bologna, is one of these townships. Qui you can find some good practises about fight against gambling. The Eurispes, Political, Economical and Social Studies Institute is a private institution and it focuses on political, economical and social research from 1982. Its monitoring on criminal activities has the purpose to inform through the elaboration of statistics and the analysis of the phenomenology of deviance. 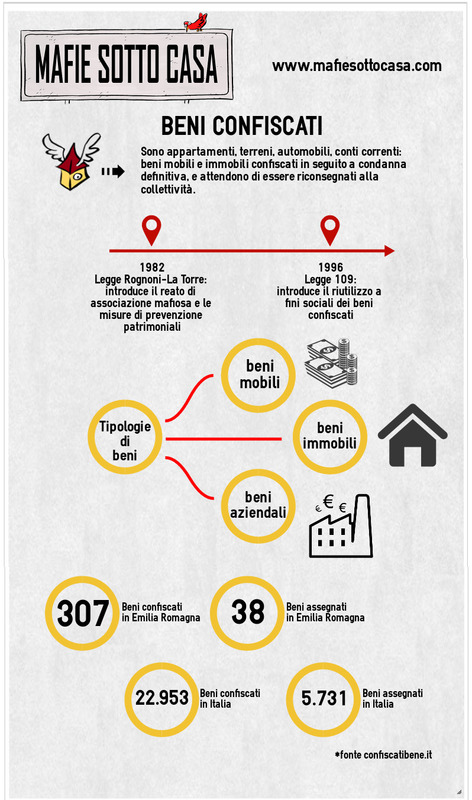 This is a dossier realised by Rimini’s Provincial Monitoring on Organized Crime. 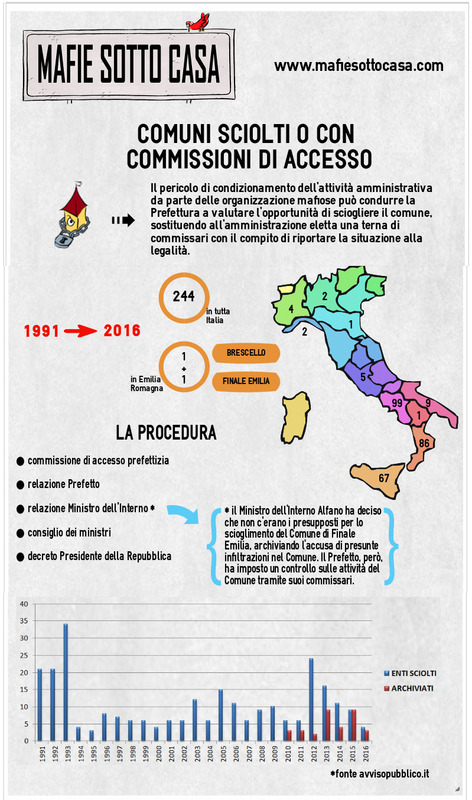 It analyses the presence of mafia in the region from 2010 to 2015. Realised by Libera Informazione Foundation in 2012. 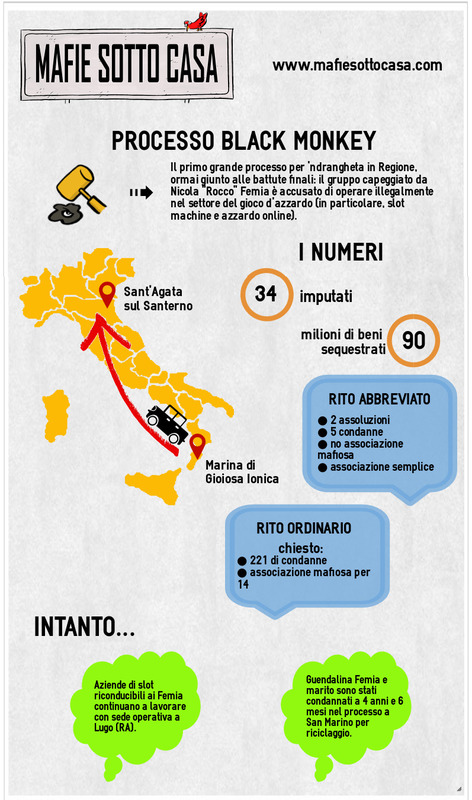 It reports the situation of the presence of mafia in the region, helped by the Anti-Mafia Investigation Department, SOS Impresa (an association which aims at defending business venture opposing mafia) and Legambiente (League for the Environment, the most widespread environmental organization in Italy). 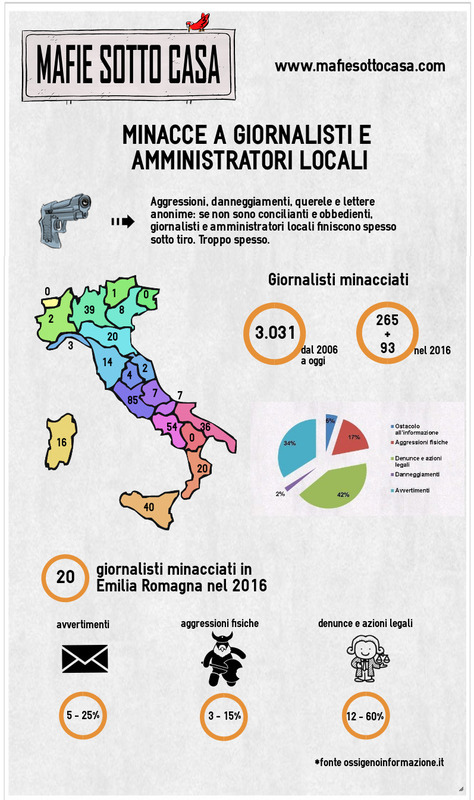 The publication — issued by the security service and the local Police of Emilia-Romagna — analyses criminal mafia-related behaviour in Emilia-Romagna, comparing it to other territories. June 2012. The Financial Intelligence Unit in Italy, established within the Banca d’Italia, is the national cornerstone for the contrast of money-laundering and the funding of the terrorism. The UIF receives information about presumed illegal activities thanks to the reporting from financial intermediaries, professionals and many more. Those information are analysed and sent to the authorities if relevant.